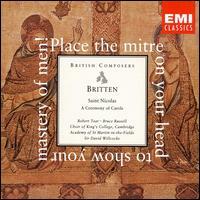 Performed by the Choir of King's College, Cambridge and the Academy of St Martin-in-the-Fields. This fourth movement of the cantata depicts a sea voyage bringing Nicolas to Palestine. During this voyage, a mighty storm assails the ship, perhaps as punishment to the faithless sailors who have mocked the pious saint. The storm is terrifying, and the sailors despair. Amidst the violent winds, waves, and rain, Nicolas gathers the sailors in prayer, and the storm subsides. So ‘Nonsense!’ they all said. Blinding sight with living light! Of battle through the raging sky! Fall and spring again once more! With its savage shouts of wonder! Praise their God with voice and motion! Spare us! Save us! Saviour! Man the pumps! Lifeboats! Lower away! Axes! Shorten sail! Reef her! Heave to! Let her run before the wind! Pray to God! Kneel and pray! Pray! O God! we are all weak, sinful, foolish men. At death, in sickness or private loss. And offer more in gratitude to Thee. Pity our simplicity, for we are truly pitiable in Thy sight. Smile down at me – and wept.